It’s hard to believe this year has flown by, but I don’t want to rush the holidays. As a writer, I’m often locked away in my office or in my head, living adventures only limited by my imagination. But with family and friends during the holidays, I want to be in the moment every day and take time with the people who truly matter in my life. My TKZ family–the contributing writers on this blog as well as the wonderful people who follow our shenanigans and share their writing trials and tribulations–you all matter to me and I love the time we spend together during the year. I know my blog mates feel the same about the community and the camaraderie we’ve built over the years. 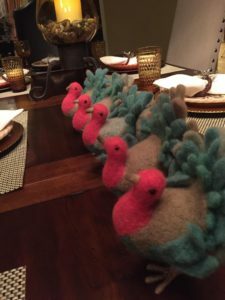 I hope after you read this post, you’ll share what you did for Thanksgiving and how it made you feel. I’ll go first. 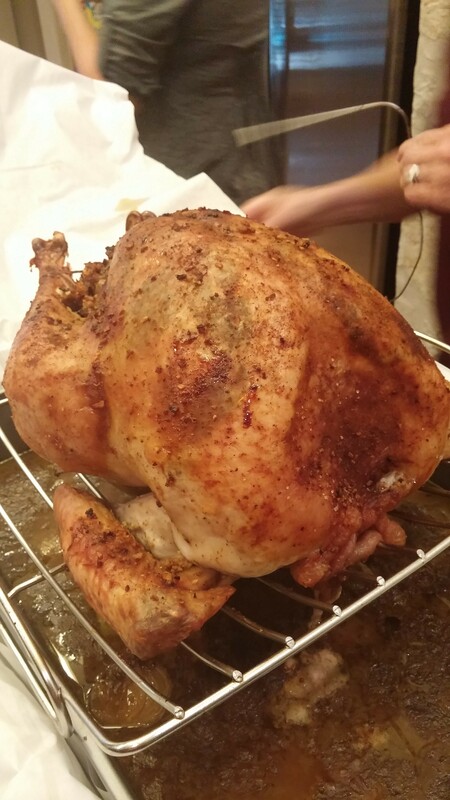 We have two turkeys (one cooked in the oven with the other one smoked or fried), mashed potatoes, Cranberry Chutney, baby peas with mushrooms and green onions, sweet potato casserole, an unusual corn recipe, Caesar’s salad, pumpkin pies, and more. Thanksgiving is a time for slowing down to count our many blessings. I love the smells in the kitchen, watching my mom help my sister make a perfect gravy, the sound of football games on TV after dinner, and the feeling of home from the experience. Here’s my family Cranberry Chutney recipe that I’m making. It’s really good and leftovers taste even better. In 3 QT sauce pan over medium heat, combine sugar and cranberries and cook until boiling, stirring frequently. Reduce heat to low and simmer 15 minutes. Crush or pop some of the cranberries with large spoon. Remove from heat and stir in remaining ingredients and refrigerate. This dish can be done a day or two before Thanksgiving. Leftovers can be made into cobbler. Enjoy! 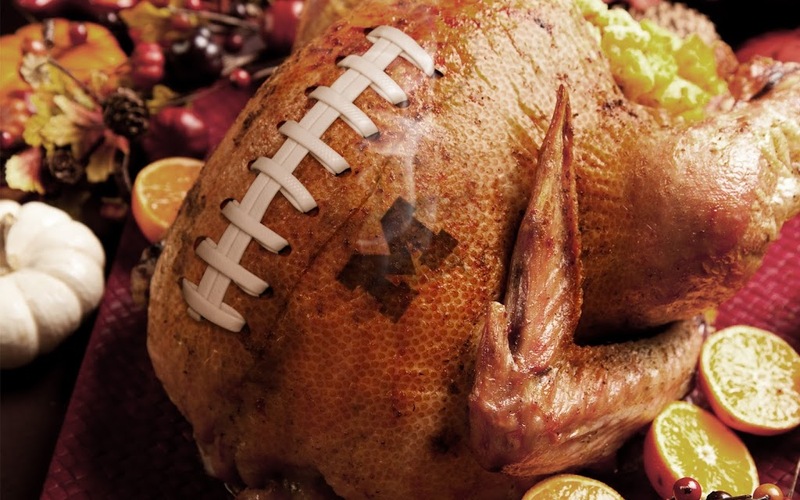 Thanksgiving Funnies – because everyone needs a good laugh when they’re wearing fat pants. 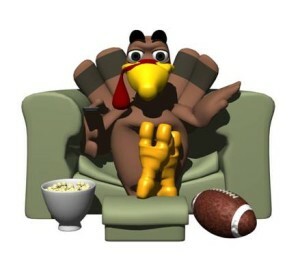 Happy Thanksgiving, TKZ! Please share your day with us. I started fulfilling my Saturday obligation by writing a post about an experience which I had with an order fulfillment company. I hit page six before I realized that no one wants to read six-plus pages of a story of little interest to anyone other than myself, particularly over Thanksgiving Day weekend. Accordingly, I herewith present a much shorter story and a much better one. Thanksgiving Day landed on my granddaughter Samantha’s sixth birthday this year. We accordingly had the traditional holiday dinner but wrapped it around the context of her special day. That meant turkey, stuffing, pumpkin pie, and the like served out on a Spongebob Squarepants tablecloth with paper plates and napkins to match. She loved it, but enjoyed her presents even more. Her requests were somewhat outside of what one might expect from someone who regards kindergarten as a police state and has become a person of interest in the principal’s office. Samantha wanted “stuff to paint with.” Stuff, she got. Such stuff consisted of an easel with a dry erase board on one side, a blackboard on the other, a paper roller and cutter, shelves for paint cups, brushes, and of course more tempura paints than I can identify (I am colorblind, so that’s not a major deal, but she still received lots of paint). She painted all day long, and now every wall on the first floor of our house is covered with artwork, two or three layers deep, in some places. Samantha asked for something else, however, which she also received: notebooks. Spiral notebooks, of all shapes and sizes. Done. I never thought to ask her why until she opened them. “I want to think of stories and write them down,” she said. What can you say to that? If I was physically capable of turning cartwheels I’d still be doing them. I don’t need to tell this group why, but I will: you can take all of the videogames and YouTube shorts and Facebook pages and all of the minutes that people spend with them and despair of the total, but if six year-old girls still dream of writing then there is hope for the future. And that made my holiday. I certainly don’t think that I was the only one who had an uplifting and defining moment the Thursday last. What was yours? Or — unlikely as it might seem — did you witness or experience something on Black Friday that warmed your heart, or gave you hope? We’d love to read your story. Some of us might even need to. Please share. I’ve been crashing on deadline, trying to get as much written before promo begins for my next release, Indigo Awakening, in December. But I am determined to take some time off to enjoy the holidays and replenish the creative well. If there is any “writerly” advice I can share today, it’s that you should embrace all people and things. Enjoy them as if you were a child seeing everything for the first time. 2.) I will spend a leisurely breakfast with my husband, John, and watch the Macy’s parade on TV with him. For whatever reason, he inherited a “parade” gene and I think it’s contagious. 4.) I’m going to hug absolutely everyone I see and take my time doing it, including One-eyed Jack, her visually challenged pug that snorts when you squeeze him. 5.) My ears will be tuned into every story and my chuckle box will be fully engaged because if there is another year ‘round tradition in my family, it is laughter. 6.) In my family, we have designated BUZZARDS. These are the few, the proud, the first at the bird. I don’t know who started this (totally ME), but the movement has been passed down to future generations. My nieces and nephews have learned the fine art of swooping in for the choice pieces (without leaving fingers behind) while my dad and Chip slice the turkey. First strike earns you a bonus round and crispy skin is double points, especially if you add in a degree of difficulty. Okay, so that is my plan. What’s yours? How did you spend your day, TKZers? 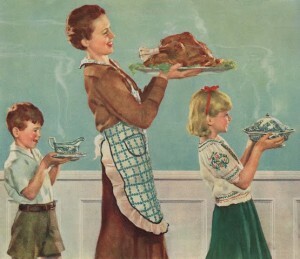 I’d love to hear your turkey day traditions and any family stories you’d like to share with your other online family. And know that at the top of my list for things to be thankful for is YOU. Write on! Thanksgiving is less than two weeks away, but potential Christmas gifts are appearing on the shelves already. The one that most immediately comes to mind is a library-bound, digest-sized book entitled JACK REACHER’S RULES, which provides handy suggestions should you decide so far off the grid that you have to have sunlight shipped in, or want to set a building on fire; it’s great stuff, and just in time for the holidays for that Lee Child fan on your list who thinks they have everything. I have made a good dent in my shopping already; of course, I want nothing for myself. I believe that I have commented elsewhere that at my somewhat advanced age I am no longer interested in acquiring more possessions; rather, I seek new experiences. Alas, those that I have suggested to my spouse have been, shall we say, shot down. I will leave it to your imagination what they might be, and why they won’t happen. So, I am asking you, since Christmas is coming…what, as far as books are concerned, are going to be looking to find under the tree in about five or six weeks or so? What do you want Santamazon to leave for you? It can be anything from the grandiose — an entire library in the basement — to the simple — a new writing journal — to something that is somewhere in between, like that slip-cased copy of MY PRETTY PONY by Stephen King that you could have picked up in a bookstore twenty-three years ago for a song and dance. What about a new tablet, the better to read DC e-comics on? Or what if Santa finishes that new novel you’ve been working on, the one that seems to be missing a hundred pages or so in the middle? What would you like? I cook the Thanksgiving Dinner at casa de Hartlaub each year. It involves some basic planning, such as buying a frozen turkey on Sunday. It sits in the refrigerator and thaws and by Thursday it’s ready for the oven. The real planning comes Thursday. I start at 7:00 AM with the pies. The lasagna goes in the over at 9:00 AM and at 9:35 I begin preparing the turkey and its stuffing. The whole kit and caboodle goes in the oven at 10:00 and then I stuff the potatoes, sit back and mfive hours later and it’s time to bake the rolls and prepare the mixed vegetable dish. By 4:00 PM dinner is served. It occurred to me this year — probably because I had a blog entry to write — that preparing Thanksgiving dinner is a lot like the act of writing. The first and foremost step is that I have to get up and start. Getting up whenever I happen to wake up and having a cup of coffee and taking 20 to 30 minutes to transition between into it is not going to do it done. Before I know it I’ve lost half of the day. I have to get up and start. The second element is making a schedule and doing everything I can to stick to it. Sometimes things, like life, get away from me, like that fire in the kitchen. We still had dinner that Thanksgiving, however, even though the dog got part of one of the pies. Since there were all males in the house, however, we ate the rest of it without worrying about germs. So too, when I’m writing: sometimes the idea will get away from me and I’ll find myself far afield, being just as clever as can be but not with anything that helps the story. I drag myself back and get on target and on schedule. And the sooner that I do that the better off I am. The third element is the possession of the proper tools to get the job done. I discovered at the last minute that I didn’t purchase one of those turkey broiling pans that I use every year (one dollar at uh, The Dollar Store) and had to go out and get it. I had everything else all lined up and ready to go. Writing, I use Word and Google docs, but when my computer crapped a sandcastle while I was in New Orleans in September I used Evernote on my T-Mobile MyTouch to take notes and write whole chapters. My fingers will never be the same, but I got it done. The fourth step is sticking with an outline. My outline for dinner is laid out above in my first paragraph. I have a more difficult time outlining a novel, but I’m finding that things work out a lot better when I do; otherwise I dislocate my arm patting myself on the back for a great beginning and a strong ending. It’s hard to fill that vast expanse of white space in between the beginning and end when your arm is dislocated. I’ve started using Scrivener, and that helps. It’s almost as good as…well, as a reliable oven. That aside: I hope that you had a great Thanksgiving. I’m thankful to have lived much longer than I really should have and to have the love I don’t really deserve from so many wonderful people. That would include, first and foremost, the family I prepare dinner for every Thanksgiving, and who are my most loyal readers. And it would include you for stopping by here regularly. Thank you, and God Bless. It’s Thanksgiving. Why are you online? 10. Hundreds of volunteers have started to stack sandbags around you. 9. Doctor tells you your weight would be perfect for a man 17 feet tall. 8. 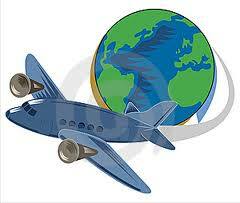 You are responsible for a slight but measurable shift in the earth’s axis. 7. Right this minute you’re laughing up pie on the carpet. 6. You decide to take a little nap and wake up in mid-July. 4. CBS tells you to lose weight or else. 3. Getting off your couch requires help from the fire department. 2. Every escalator you step on immediately grinds to a halt. My other blogger mates would have a thought provoking post about much more heady matters, but hey, that’s not me. With the tense novels I write, I need a good laugh. So I dug out my parachute pants and got into it with M. C. Hammer. As we speak, I’m having Thanksgiving at my sister’s house. (I know. You thought I was online with you, but I hate to break it to you, I posted early. Sorry.) 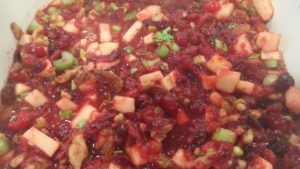 This year it was my responsibility to make a family classic, our traditional Cranberry Chutney, one of my dad’s contributions. But after seeing this video, I’m not sure I’ll ever be able to eat cranberries again. For the sake of discussion, I’d love to hear from you, as long as you’re here. What are your favorite things to do on Thanksgiving? And what dishes do you consider sacred MUST HAVE traditions? That I get such great support from friends, family, fellow writers and fans so that even in the bleakest of November moods I can see a glimmer of hope. That I finally had my hair cut. But enough about me…what are you thankful for? PS: In the spirit of Thanksgiving, I’d also like to invite all killzoners to help out Basil Sands in his quest to name his blog radio show. He’s offering $25 if you suggest the name he ends up using, and for those of you who regularly read the comments you know he is hilarious (so his show is bound to be great!). You can visit his website: http://www.basilsands.com/ for more details. Believe it or not, a number of Americans have asked me how we celebrate Thanksgiving in Australia…before I remind them (with a cough) that Australian don’t celebrate Thanksgiving – it’s (another cough) an American ritual…and believe it or not they often seem genuinely shocked. I am an unapologetic adopter of celebrations – I figure when in Rome…So my family are the ones cheerfully flying the American flag and organizing the Fourth of July street party. We take our boys trick or treating (something that growing up in Australia we never did) and at Thanksgiving we oblige by going through the whole nightmare of traveling, visiting and cooking – all in honor of our adopted home. I like celebrating. I like eating and drinking (I am, after all, an Australian!) and we get to enjoy the best of both worlds. We fly the Australian flag on Australia Day and enjoy explaining the often strange rituals and celebrations of our homeland – which even to this day celebrates English holidays such as Boxing Day (which is the day after Christmas) despite the fact that no Australian I know has the least idea what this day is all about (apart from post-Christmas sales!). When researching my Ursula Marlow series I came across a social calendar for 1910 which revealed just how the Edwardians set their calendars by events such as yacht races, polo and cricket matches, art gallery openings, theatre season etc. I was jealous just thinking about the pace of life back then. My favorite holiday is ‘Empire Day’ – it’s such an imperialistic conceit that I almost wish it was still celebrated – only because it would reveal how the British Empire is no more. Of course Australia is still officially part of the Empire and as we have failed to ever pass a referendum to become a republic, the Queen of England is still our head of state. Yes, we even have a public holiday in honor of the Queen’s Birthday – now isn’t that hilarious! (Hey, I’m not knocking it though – I’m all for public holiday’s no matter what they are in aid of!). Nothing in my research however is as funny as seeing American reactions to one very famous public holiday in Melbourne – one celebration that reveals the quirks of Australia that Americans would probably find hard to believe. That day is Melbourne Cup Day – the first Tuesday in November. It’s my all time favorite holiday mainly because my birthday quite often coincides (as it did this year) and who would ever complain about having a public holiday on their birthday?! So there you have it – in Australia we give everyone the day off in celebration of a horse race. Some food for thought…what rituals and celebrations have you adopted and what have you brought with you from your other home (if you have one)? And in the spirit of Thanksgiving what are you thankful for?